­Established in 1989 and published each month except July. “I am extremely encouraged to see the entire focus of the faith formation of our young people change. The focus from education to formation is to build in our young people a permanent and lifelong bond with God and with God’s Church.” Deacon Chris Deskus reacting to the new faith formation curriculum. Sister Mary Jude, Director of Hispanic Ministry and organizer of the March 24th Migrant Caravans Forum, speaking about Saint Oscar Romero. 20 “Think about how you feel right now and remember this for the rest of your life -- take a minute and be in the present” Mary Ellen Mahoney, at the Annual Christopher Society Dinner, reflecting on advice from her mom. 29 “Thanks to your helpful voices and the dedication of groups allied together in opposition we were able, for the fifth year, to convince Connecticut’s legislators to reject physician-assisted suicide as a healthcare option in our state.” The Connecticut Catholic Public Affairs Conference sharing the decision of the Connecticut General Assembly's Public Health Committee not to vote on HB 5898. 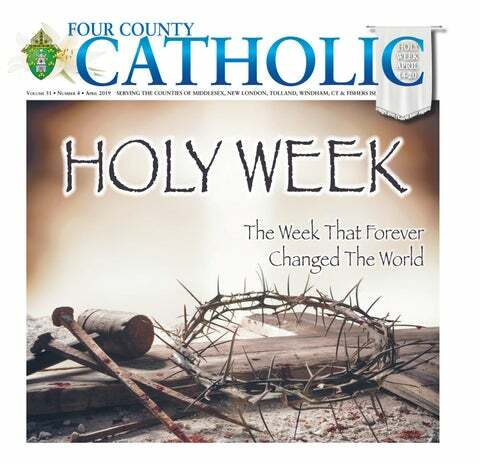 Four County Catholic, 31 Perkins Ave., Norwich, CT 06360-3613 FOUR COUNTY CATHOLIC Issue 3 April (PE 9934) is published monthly except July by The Diocese of Norwich, 31 Perkins Avenue, Norwich, CT 06360-3613. Periodicals postage paid in Hartford, CT 06101 and at additional mailing offices. is also apparent by the ongoing assistance that they give, both financially and through prayer, to the many ministries of the Diocese. Choosing to seek the good of others through their selfless example of faith, they also make daily choices in strengthening their walk with God. This journey is not always easy. The path can be rough. We sometimes find ourselves in a desert. And much like Jesus in the desert, Satan, the tempter, seeks to divert us from our Heavenly Father’s plan. Fortunately, Jesus already experienced this path and showed us the way. (Luke 4:1-13) Deserts are very hostile places. Recently I was in Peru and they are indeed deadly places, full of scorpions, poisonous snakes, scorching heat by day and freezing cold by night, to say nothing about the lack of water. It is clear from scripture that deserts were places of encounter; places of renewal and places of testing. It is not unusual for God to test those He loves. He tested Noah. He tested Abraham. He tested Moses and the Israelites. He tested Mary and Joseph. He tests those He loves. We are tested today. Difficulties surround us in our workplaces, in our homes and in society. Fortunately, Jesus remains the model, decisively rejecting temptation, turning to God‘s word to fight Satan, the Father of Lies. We are called to turn away from the temptations that this world sets before us. ministerios de la Diócesis, tanto financieramente como a través de la oración. Buscan el bien de los demás a través de su ejemplo de fe desinteresada, también toman decisiones diarias que fortalecen el caminar con Dios. Este viaje no siempre es fácil. El camino puede ser duro. A veces nos encontramos en un desierto. Y al igual que Jesús en el desierto, Satanás, el tentador, busca desviarnos del plan de nuestro Padre Celestial. Afortunadamente, Jesús ya pasó por esa experiencia y nos mostró el camino. (Lucas 4: 1-13) Sabemos, que los desiertos son lugares muy hostiles. Hace poco estuve en Perú y, de hecho, son lugares fatídicos, llenos de una gran variedad de peligros: escorpiones, serpientes venenosas, calor abrasador durante el día y frío por la noche, por no hablar de la escasez de agua. Está claro en la escritura que los desiertos eran lugares de encuentro; lugares de renovación y lugares de prueba. No es raro que Dios pruebe a los que ama. Probó a Noé. Probó a Abraham. Probó a Moisés y a los israelitas. Él probó a María y a José. Él pone a prueba a quienes ama. Hoy estamos a prueba. Nos rodean las dificultades en nuestros lugares de trabajo, en nuestros hogares y en la sociedad. Afortunadamente, Jesús sigue siendo el modelo, rechazando de manera decisiva la tentación, recurriendo a la palabra de Dios para combatir al Padre de la mentira, a Satanás. Estamos llamados a alejarnos de las tentaciones que este mundo nos presenta. El recorrido de los Catecύmenos y los Candidatos no concluirá con el tiempo de su preparacion y con su recepcion a la iglesia en la Vigilia Pascual. Springtime Blooms with New Vocations Father Gregory Galvin, Director of Priestly Vocations It’s is hard to believe that by the time Easter arrives this year we will only be ten days away from the month of May. God continues to answer the many prayers from all parts of the diocese regarding an increase of vocations. I am excited to announce that Bishop Cote happily accepted Mark Johnson into sponsorship to begin studies for the priesthood. Mark has been discerning a vocation to the priesthood actively since his sophomore year at UCONN and will hopefully be accepted into seminary later this summer. He will be graduating from UCONN in May, with two degrees in science. Mark grew up attending St.
As you can see much is going on in the diocese regarding vocations to the priesthood. Therefore, I also want to call to your mind that this coming May, we have our Annual Diocesan Seminary Education Fund collection. We appreciate the prayerful support for our seminarians. Please consider making a gift towards their education. Your donation makes it possible for these men to be well trained and well prepared to lead God’s family in the future. We appreciate the support you give to our future priests. Have a blessed Holy Week and Easter Season. Bishop Cote for June 29, 2019. Bishop Michael R Cote celebrating the Holy Sacrifice of the Mass from the Archdiocese of Hartfordâ&#x20AC;&#x2122;s studios in Prospect. Mass is broadcast and streamed live daily at 10am by the Office of Radio and Television on WCCT and WTXX. 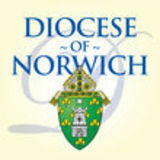 A link to the live stream can be found on the NorwichDiocese.org website. Father Arthur died on March 23, 2019 at his home in Litchfield Connecticut. He was 92 years old. Arthur was drafted into the US Army Infantry Division and served two years with the Army of Occupation in Japan, from 1945-1947. After release, he studied at Carrol College in Waukesha, Wisconsin where he earned a BA in History and English. He went on to earn a Masters in Theology at the Berkeley Divinity School at Yale University and was ordained an Episcopal priest in 1954 where he served as pastor at St. Margaret of Scotland Church in Queens New York. There he began his long career in service to the Lord and his beloved parishioners. While serving as pastor, he went on to study Library Science at St. John University in Jamaica, New York and worked as a librarian at LaGuardia Community College. His love for books, art and music, was shared with those who knew him well and influenced many of his beloved. In 1980, he was ordained as a Catholic priest and served as the Assistant Pastor of St. Maryâ&#x20AC;&#x2122;s Church, New London (1980-1984), Pastor of Notre Dame Church in Durham, (1984-1991) and finally as pastor at St. Agnes Catholic Church, Niantic (1991-2005). While serving as a priest, his presence was felt as a strong spiritual leader and friend. In 2005, he retired and moved to Mystic, where he spent many hours on his deck, overlooking the Mystic River, enjoying the water. Born in Detroit, Michigan on January 12, 1927, to Grace (Lidington) and Selwyn Archer he was predeceased in death by his sister, Dorothy Joan Mette of Rochester Michigan, and is survived by his sister, Arlene Adele Rutz of Ann Arbor, Michigan and his brother-in-law Richard Francis Mette of Rochester, Michigan. He was also predeceased by his brother-in-law, Robert Rutz. Also surviving him are his nine nieces and nephews of whom he was very fond. Donations can be made in his honor to St. Edmunds Retreat at Enders Island, 1 Enders Island, PO Box 399, Mystic, CT 06355. April 14 at 7:30pm to see the Wolfgang Amadeus Mozart-Requiem featuring members of the ECSO, Toshiyuki Shimada, Music Director and Conductor; Eastern Connecticut Symphony Chorus, Wendy Moy, Director Sarah Yanovitch, Soprano; Caroline Olsen, mezzo-soprano; Ethan Depuy, tenor; Gregory Flower, baritone. General admission seating is free and the doors will open at 6:45pm. Goodwill donations collected at the event will benefit the ECSO and the St. Vincent de Paul Place in Norwich. Join us at the Cathedral of St. Patrick at 7:30pm to see the Wolfgang Amadeus Mozart-Requiem featuring members of the ECSO, Toshiyuki Shimada, Music Director and Conductor; Eastern Connecticut Symphony Chorus, Wendy Moy, Director Sarah Yanovitch, Soprano; Caroline Olsen, mezzo-soprano; Ethan Depuy, tenor; Gregory Flower, baritone Admission is Free for all attendees. Goodwill donations collected at the event will benefit the ECSO and the St. Vincent de Paul Place in Norwich. Join us at St. Columba Church, Columbia at 7:30pm for this moving and dramatic service. Tenebrae is an occasion to pray and contemplate Matthew's account of Jesus’s death and burial while mediating on the words of our sacred scripture, meditations and powerful music. This service consists of 7 readings of lamentation and gradual extinguishing of candles. On Good Friday, we are fully aware that the story does not end on Calvary. Tenebrae reflects this understanding of Christ’s Paschal sacrifice and its fulfillment. All are welcome. A celebration for healthcare workers and caregivers of all faiths. 9am at the Cathedral of St. Patrick, Norwich. Brunch to follow in Cathedral auditorium. Featuring Dr. Frank Maletz, MD who will deliver the David P. Lauler, MD and Joan M. Lauler, B.S.N lecture. A donation of $25 per person is requested. For more information, to make a reservation, or to reserve a table, please call 860-887-9294, ext. 100. Close to Home. Close to Your Heart. Saint Bernard School instills the values, traditions, and skills that will guide your child though tomorrow. Ask us about our TAILORED TUITION PROGRAM to help meet your family’s unique financial situation. Dedicating our love, compassion and service to our community. Podemos ayudar Para reportar contacto inapropiado de cualquier tipo por medio de un representante de la Diócesis de Norwich o para asistencia a víctimas, por favor llame a La Línea de Reportaje de la Diócesis de Norwich 1-800-624-7407 Si el incidente involucra a un menor (personas menores de 18 años), también debe llamar a Departamento de Niños y Familias de CT 1-800-842-2288 -O-Servicios de Protección de Niños del Estado de NY 1-800-635-1522. Incidentes relacionados con el abuso de adultos vulnerables de 18-59 años de edad deben ser reportados a Departamento de Servicios al Desarrollo del Estado de Connecticut-División de Ayuda para Personas con Incapacidad Intelectual 1-844-878-8923. Incidentes relacionados con el abuso de adultos vulnerables de 60 años de edad o más deben ser reportados a Departamento de Servicios Sociales Para Ancianos de Connecticut 1-888-385-4225.
he Holiday Inn in Norwich was the setting for the Diocese of Norwich Annual Catholic Appeal Leadership Meeting on March 7. Priests, parish secretaries and parishioners from all across the diocese who volunteer their time to assist with the Annual Catholic Appeal (ACA) came together to begin the vital work that will make a difference in the lives of God’s children and help make this year’s appeal a success! If you’ve walked hand in hand in the past supporting the ACA with your parish leadership team, thank you and we hope you will join us again this year. If you haven’t participated in the ACA, we hope this year you are able to extend your hand to help others. To learn more about the 2019 Annual Catholic Appeal and about how you can help support the ministries and programs in the Diocese of Norwich, please visit www.norwichdiocesedevelopment.org and make your pledge or call the Office of Development at 860-886-1928. By building bridges of faith, Catholics link together mutual sharing of resources in Jesus’ Name. This involves going outside of one’s comfort zone, crossing over into another culture, into another economic, linguistic & political system. Parish Twinning is truly an outreach to our sisters and brothers who share our faith, but not all the material blessings we enjoy. Parish Twinning starts with a Parish discerning if God is calling them to reach out to help build up the Church beyond the boundaries of the Parish. God has led the Diocese of Norwich to twin with the Archdiocese of Port au Prince, Haiti. There are many poor parishes in the Archdiocese that could use assistance. What a difference help can make! Twinned parishes support teachers’ salaries, scholarships, nutrition and other programs to break the cycle of poverty. Diocese of Norwich Outreach to Haiti has parishes twinned through us from the following areas: Dioceses of Norwich, CT; Superior, WI; Archdiocese of Hartford, CT; Milwaukee, WI & Seattle, WA. The needs are great in Haiti, the resources not so much. Is God calling your parish to enter into a faith-filled growth experience? Please speak with your Pastor and investigate the possibilities. Haiti is the poorest country in the Western Hemisphere. The Church in Haiti is as poor as the people. The Faith is strong in Haiti and 70% of the people are Catholic. Their gift is the witness of their Faith, trusting in God, despite all the turmoil and poverty in their lives. As the Bishop of Norwich, Most Reverend Michael R. Cote, has stated “we get more out of Haiti spiritually than we put into the country materially”. The Stations of the Cross, a great resource for prayer and meditation, traces Jesus’s journey from His trial before Pilate to His placement in the Tomb, increasing both our sorrow for our sins and our desire for His help in avoiding temptations and in bearing our own crosses. Meditating on Christ’s passion can help us become more like Him in imitating His virtues of obedience, humility, charity, patience and perseverance. Although most popular during Lent, this season is not the only good time to pray the Stations of the Cross. Meditating on Christ's Passion frequently, especially on Fridays throughout the year as a perpetual day of penance, can help us grow in holiness. Here are some questions that you may want to contemplate while meditating on each station. How do you think Jesus felt when this was happening? What was he thinking? What is your cross to bear? How heavy is it? How does it affect your relationship with God? Where did your cross feel the heaviest today? Where did you encounter the cross on the shoulders of others at work, on the news, or in the streets? Where is God in these encounters? What did you do to help that person carry his or her burden? THE STATIONS O Could you walk a mile in Jesus’s shoes? The Stations of the Cross, a centuries old spiritual practice, brings us closer to Christ as we meditate on the great love, He showed for us in His most sorrowful Passion. Tradition traces this loving tribute to our Lord back to the Blessed Mother’s retracing her son’s ast steps along what became known as the Via Dolorosa (the Sorrowful Way) on His way to His Crucifixion at Calvary in Jerusalem. something to make changes, especially for the poor. We need to move forward with Monsignor Romero." migrating are up, as we've seen in the news, but still nowhere near what they were in the early 2000s," she said. "We have to ask ourselves, why he was such a symbol of fear for some, and hope for others," Sister Mary Jude said. "How does what happened then in El Salvador connect with what is happening today?" She also said Archbishop Romero's life and work were points of reference for facing similar challenges today in the United States. At the same time in the church hall, Professor Anne Gebelein, the associate director of the Institute of Latina and Latino, Caribbean and Latin American Studies at the University of Connecticut, gave an English-language overview of the history of why large populations of poor people in El Salvador, Honduras and Guatemala have fled their home countries. Gebelein concluded by paraphrasing a quote from Pope Francis: "We are all being called to be islands of mercy in a sea of indifference." Guest speaker Walter Mena, the Massachusetts statewide coordinator for committees on immigrant rights, worked with the Archbishop in pastoral ministry and was present at his funeral on March 30, 1980. Professor Gebelein tied the conflict, political and economic upheaval and genocide in those countries to the Cold War between the United States and the Soviet Union. After giving their talks, the bilingual speakers switched locations and audiences to provide brief summaries of their presentations. Afterward, Jennifer Blanco spoke about how her parents came here from El Salvador when she was young. Blanco later followed and said the journey was challenging. "There was one thing that kept us going: Seeing my mom here," she said. "Thanks to her and to the power of God. Without His will I would not be here." The talk coincided with the 39th anniversary of the assassination of Oscar Romero, Archbishop of San Salvador. Romero advocated against poverty, social injustice, assassinations and torture. He was shot while celebrating Mass in 1980 in El Salvador. Pope Francis canonized Archbishop Romero as a saint on Oct. 14, 2018. We Make a Difference Time to clean? Doesn’t it feel like you just finished cleaning and its time to do it again? It’s neverending! It’s time to leave the vacuuming, the bathrooms, the mopping and making the bed chores to our friendly cleaning staff at Creamery Brook. The evening concluded with Bishop Cote and Sister Rita Johnson doing their famous “George and Gracie” routine. Everything went smoothly and following my mom’s advice, before my husband and I left for the night, I sat down and took notice of how I felt at that moment. My feeling again, was sheer gratitude. Thanks, Mom! To view the ACA video or learn more about the 2019 Annual Catholic Appeal and about how you can help support the ministries and programs in the Diocese of Norwich please visit www.norwichdiocesedevelopment.org and make your pledge, or call the Office of Development at 860-886-1928. $20 Participant Study Guide will be available at the 1st session. St. Mary - St. Joseph School in Willimantic celebrated Read Across America Day and Dr. Seuss' Birthday on March 1st. Dr. Seuss inspired activities included a photo booth, snacks, Buddy reading time and crafts. Students and staff dressed up as Dr. Seuss characters with community guest readers coming in to recite Dr. Seuss Books to the Buddy Classes. It was a fun day of reading and working together! O Most Beautiful Flower of Mt. Carmel, Fruitful Vine, Splendor of Heaven, Blessed Mother of the Son of God, Immaculate Virgin, assist me in my necessity. O Star of the Sea, help me and show me herein you are my Mother. O Holy Mary, Mother of God, Queen of Heaven and Earth, I humbly beseech you from the bottom of my heart to succor me in my necessity. There are none that can withstand your power. O Mary conceived without sin, pray for us who have recourse to thee. At Biosphere 2, one of the world's most unique facilities dedicated to the research and understanding of global scientific issues, students were taken on a VIP tour where they saw the mechanisms behind the functioning of the enormous greenhouse and the life support functions that make it self-sustaining. The University of Arizona is currently using the greenhouse to study climate change and to explore the challenges of sustaining human life on other planets, specifically the Mars Mission. During their trip, students met with Dr. Brenda Frye, an astrophysicist at the University of Arizona who answered questions about women in science, black holes, space-time, life on other planets, and the future of space travel. Students had the opportunity to have dinner and speak with Brother Guy Consolmagno, SJ, Director of the Vatican Observatory in Rome. Joining him on this trip to Arizona were Father Justin Whittington and Father Paul Gabor who are also from the Vatican Observatory. and the existence of black holes. Within the planetarium is a mineral and gem museum where students were able to see crystals, rare minerals, and fossils. The Girls’ Varsity team of St. John (Old Saybrook) defeated St. Joseph of New London 43-27 and went on to earn the title “2019 League Champions.” The two teams have been quite competitive all season; both displaying tremendous effort and improved skill. The Boys’ Varsity team from St. Bernard Academy was on fire as they came up against St. John of Old Saybrook with a 55-48 victory. The excitement shook the gym as both teams battled. The Norwich Diocese Basketball League (NDBBL) Varsity Play-off Tournament was held on March 4-8 and was hosted by St. John School of Old Saybrook. Congratulations to all for showing great skill and sportsmanship. An Education You Can Believe In. remainder of the match. The robotics event was hosted at Wilby High School in Waterbury. Forty-one teams took part in the three-day tournament FIRST® Robotics program. This is the TechTigers’ second win at the Waterbury event (prior win was in 2017). Teams who collect enough points in the eight-week District season advance to qualify for the New England Regional Championships at Worcester Polytechnic Institute (WPI) April 10-13. The TechTigers are in their ninth season in the FIRST® Robotics Competition (FRC) program. The team consists of twenty-three Mercy High School students and nine professionals who serve as mentors. The team is supported by their school, and leading sponsors; United Technologies, Bob’s Discount Furniture, Filipino-American Association of Engineers, Inc., Tsunami Tsolutions, and Karen and Tom Keenan. The mission of FIRST® is to inspire young people to be science and technology leaders and innovators, by engaging them in exciting mentorbased programs that build science, engineering, and technology skills, that inspire innovation, and that foster well-rounded life capabilities including self-confidence, communication, and leadership. The TechTigers are one of only two all-girl teams of the 210 teams who participate in the New England Region. More information about the team can be found at techtigers3654.org/ and the team can be supported at robotics.mercyhigh.com. In this five-session series you will discover: • The Biblical background to each scene in Christ’s passion. • What did Jesus go through at each moment? • How did the Old Testament foretell Jesus’ death? • Why did Christ die for us? What did it accomplish? • What was the meaning of the tearing of the temple veil, the crowning with thorns, and other events during Christ’s Passion? Presentations will be at 7pm. Thursdays April 11 & 25 at Our Lady of Lourdes 1650 Rte 12, Gales Ferry (across from CVS) In case of adverse weather the schedule will be extended. Reserve Your Place by Contacting: Our Lady of Lourdes: 860-464-7251 / secretary@ololgf.org . A $25 fee for Dr. Sri’s two volume set (Book & Study Guide) may be paid in advance or at the 1st session. If we abandon the law of love, the law of the strongest over the weakest will be asserted. Trust in the mercy of God’s love. If you are carrying the grief and sorrow of past abortions, call Project Rachel a post-abortion healing ministry. All calls are confidential. You receive a tax deduction. You decide where your donation goes. The Connecticut Catholic Public Affairs Conference is pleased to report that the Connecticut General Assembly's Public Health Committee has decided not to vote on HB 5898 (the physicianassisted suicide bill) this 2019 legislative session, and that there is little hope it will return next year. Thanks to your helpful voices and the dedication of groups rallied together in opposition, we were able for the fifth year to convince Connecticut’s legislators to reject physician-assisted suicide as a healthcare option in our state. ALL DAY EVERY DAY ! The Conference will proudly continue to promote a culture of life and support for the sick, the disabled, and the elderly. We thank you for your support! We could not have accomplished this without all of you. Lent, Easter,RCIA & First Communion Our mission is simple. To build God’s kingdom by focusing on the good news of Jesus through books, Scripture, music and other resources. Our store is filled with a large selection of books, Bibles, greeting cards and unique gifts you’ll love. You’ll be hard-pressed to find a better combination of selection of sacramentals and services anywhere else. If we don’t have what you are looking for, we will find it and order it for you..... Stop in the store, meet our great staff and experience Merciful Saviour today. Offering “shadow” days where we allow your child to join us for the day to immerse in our faith community. Engaging minds, nurturing hearts. Call now to schedule your visit! Discover what a Catholic education can do for your child! Several trips to different destinations: the Holy Land; Italy; France, Portugal, & Spain; Poland; Medjugorje, Lourdes, & Fatima; Ireland & Scotland; England; Austria, Germany, & Switzerland; Greece & Turkey; Budapest; Prague; Our Lady of Guadalupe; Peru; Domestic Destinations; Columbia; Brazil; Argentina; etc… We also specialize in custom trips for Bishops, Priests, and Deacons.